The Global Happiness and Wellbeing Report is designed to help bring best practice to life and inspire others to adopt or advance their practices. Here are Sue Langley’s key outtakes from the report. 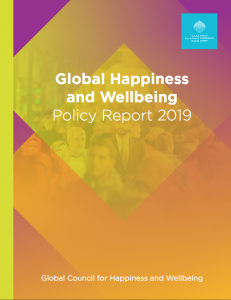 The 2019 Global Happiness and Wellbeing Report1 was launched in February at the World Government Summit, as discussed in a previous blog. During the event, there were several sessions launching the report2, followed by discussions of some of the key findings and best practice. The Global Happiness and Wellbeing Report is written by a group of independent experts under the banner of the Global Council for Happiness and Wellbeing, and these experts include leading happiness and wellbeing scientists, researchers and practitioners across a range of fields. The report focuses on evidence-based policies and activities at a local, national and international level across psychology, economics, policy, urban planning, education, health, business, civic and government. It is designed to help bring best practice to life and inspire others to adopt or advance their practices. The Director of the Council is John Helliwell, and, in his introduction, he announces the purpose of the report to be focused on what is being done around the world, and on “redirecting the aims and contact of government policies so as to increase equitable and sustainable human wellbeing.” It is designed to help governments and organisations focus more on happiness and wellbeing, to achieve and measure social and economic development and to figure out what to do better! Increased focus on wellbeing! We would like to congratulate our Langley Group clients, who know how important this is, and who are already making great strides in this area. Wellbeing is not just a tick box exercise. It is real and important if we want engagement, productivity and profitability, and to make a positive difference in the world. Targeting of social relationships at work. This is becoming more important now with agile working and the gig economy. Organisations need to learn and implement strategies to focus on building relationships to keep that sense of meaning and engagement. We know from decades of research that relationships are one of the number one contributors to high levels of wellbeing. All our engagement surveys ask questions about a ‘best friend at work’ or ‘someone who cares about me at work’ – yet often organisations need to bring this to mind when designing their offices and flexibility at work practices. Job crafting – this is something we focus on in the Langley Group’s Positive HR Toolkit and is going to become even more important according to the Global Happiness and Wellbeing Report. Making jobs more aligned, more interesting and more connected to the individual’s strengths. Measurement is important, and more case studies and research is needed from organisations doing this well, although it is more important to be doing it authentically. “Benefits of healthcare should be measured in terms of happiness, not just health.” – this is something we discuss with regards to the current focus on the deficit model in healthcare. We often zone in on someone being on the negative end of a scale, and how we get them back to zero. The report suggests flipping this focus to be more on how we can move someone into the positive end of the scale. Discussions during the conference focused on personalised health as a proactive response from the medical profession, which is soon to be a reality. Technology is allowing us to improve testing procedures which could see changes in treatment, as well as preventative activities to keep people healthier longer. Focus on expanding benefits beyond patients to carers and families to improve support and healthcare understanding. A key issue around the world is going to be the focus on aged care, and improving our policies around positive aged care! Expanding cultural immersion to really build diversity and inclusion from a younger age, understanding diverse culture and benefits of wellbeing across societies. Improving stakeholder involvement across communities – beyond the school and parents, into connections with other groups in the community and building engagement. Curriculum development and implementation to include life skills. This is good news for us as we focus on teaching emotional intelligence to adults, yet government really need to focus more on wellbeing and emotional intelligence from school-age years. This includes educators, as many new teachers coming into the education system now have lower emotional intelligence skills, and have difficulty picking up emotional signals from their students. Measurement and evaluation of wellbeing across the education years, as opposed to just academic statistics. The need to empower people to take responsibility for their communities. We often use the analogy in positive psychology about the apple and the barrel and the barrel makers. Whilst changes in policies are needed and will improve the barrel, we also need the apples in the barrel to take responsibility for creating the environment for all apples to thrive, and some of these people are the barrel makers who are creating the systems and policies. As I mentioned in a previous blog on the World Government Summit, I was left with one key ‘ah-ha’ moment at the launch: the key theme of ‘belonging’. We have a human desire to connect. Social connection is essential for our wellbeing – at work and in our communities. We may know this, yet as we say at the Langley Group, “you know it, do you do it?” What are you doing to build social connection into your life? Download this brief report which shows that investing in wellbeing makes good strategic and financial sense based on the significant and tangible value organisations can realise by proactively enhancing workplace wellbeing. Download here.